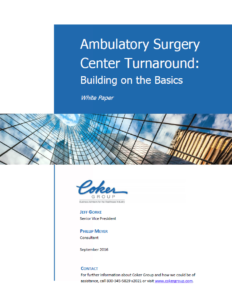 Ambulatory Surgery Centers (ASCs) consist of many moving parts that must operate effectively for the ASC to flourish. If even one of these components malfunctions, the ASC will suffer. Left unchecked, the financial health of the center will deteriorate. To maximize operational and financial efficiency it is important to understand the basic components at work and discern how well each is functioning. Only then can changes occur that reverse the trends. Using a case study, this paper will describe the decline of one ASC and the discovery of dysfunction throughout the center. Then, it will outline the positive turnaround in financial and operational actualization that resulted from addressing each component that was off track and on the verge of breaking apart. The study also reports on the creation and deployment of a broader strategic plan to help the ASC expand its procedural breadth.